Navaratri, in Sanskrit नवरात्रि, translates as ‘nine nights’ and is a celebration that has been observed for centuries in India. It honors Devi (Durga), the divine Goddess and Great Mother. It takes places on the first new moon in autumn each year. This year, festivities start on the 9th and end on the 18th of October. This festival symbolizes the journey of humanness to divinity. The aim of celebrating this festival is to remind people of the true goals of human life and to allow them to understand the value of doing good and overcoming negativity. Navaratri is held in commemoration of the victory of goddess Durga, from a story recounted in Devi-Mahatmya where Durga spends nine days battling the buffalo demon Mahishasura. The buffalo demon represents the ego and forces of ignorance. On the tenth day, Durga emerges victorious in a triumph of light over darkness, good over evil. In the northern and western states of India, the festival celebrates the battle and victory of god Rama over the demon king Ravana. In southern states, the victory of different goddesses, of Rama or Saraswati is celebrated. Yogis do not necessarily see Navaratri as a religious process, but rather as a psycho-spiritual one, and a unique opportunity for yogic practice. Yogis make use of the auspicious cosmic energies available at this particular time of the year to elevate their level of practice or sadhana. It is said that an hour of sadhana during this auspicious period of ten days is equivalent to 100 hours at any other time. These nine nights are solely dedicated to Goddess Durga and her nine incarnations, each day is associated to one of them. These aspects of Durga represent energies within our own self and by focusing on them, we can connect with these inner qualities. Known as Pratipada, this day is associated to the Gooddess Shailaputri: Daughter of Mountain. She is depicted as riding a bull with a trishula in her right hand and lotus in her left. The Goddess blesses her devotees by preventing them from negativity and illness and provides them with stability in life. On Dwitiya, Goddess Brahmcharini, another incarnation of Parvati, becomes Sati, her unmarried self. She is honoured for emancipation and endowment of peace and prosperity. The Goddess is seen as calm, serene, magnificent and peaceful wearing white silk, with a rosary of Rudraksha in one hand and Kamandalu in another hand, depicted walking barefoot. Honouring Goddess Brahmacharini opens the path of Moksha or liberation from the cyclic wheel of life and death; the path to end suffering. The color royal blue is used on this day to express these qualities. Tritiya is associated to Chandraghanta. After marrying Shiva, Parvati adorned her forehead with a half moon. Goddess Chandraghanta symbolises protection from difficulties and is the energy of fearlessness. She is the embodiment of beauty and is also symbolic of bravery, and hence, the color of the day is yellow. The Goddess Kushmanda is magnificent and illuminating, glowing like a Sun. The Goddess is known for her strength and capability to live inside the Sun as a cosmic energy. This manifestation of the mother goddess Durga is the creator of the energy responsible for the creation of life. Symbolizing the creative power of universe, she is associated to the endowment of vegetation on earth and hence, the color of the day is green. 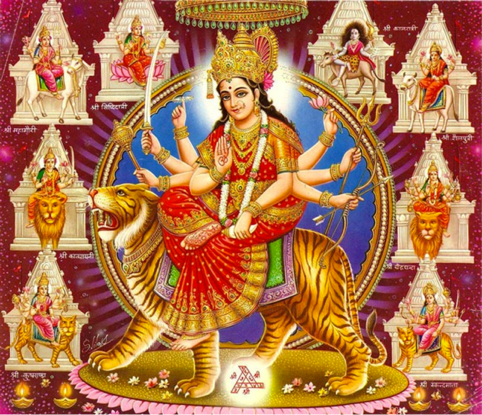 She is depicted as having eight arms and sits on a tiger. Goddess Skandamata, is the mother of Skand who represents Lord Skanda or Lord Karthikeya, the God of worship. Lord Karthikeya is the eldest son of Lord Shiva and mother Goddess Parvathi or Durga and elder brother of Lord Ganesha. She is depicted riding a ferocious lion, having four arms, and holding a baby. The color grey is used on this day to symbolize the transforming strength of a mother when her child is confronted with danger. This Goddess showers her devotees with health and wealth. Born to a sage, Katya, she is shown to exhibit courage which is symbolized by the color Orange. Known as the warrior goddess, she is considered one of the most violent forms of Goddess Parvati. This form of the goddess is magnificently beautiful with three eyes and riding a lion. The goddess is having lotus in one hand, carrying a sword, chakra, Dhanush, arrow, gada, trident, in her eight hands and the right hand is in abhayamudra or varmudra. The Goddess Katyayini blesses her devotees with courage and velour, with a focus on those who are in the education field. Considered the most ferocious form of Goddess Durga, Kalaratri is commemorated on the seventh day. The Goddess Durga is the protector who transforms into a fierce form, depicting the other side of the Mother Nature. The Goddess is seen with skin as dark as night, wearing a garland of skulls and clothed in animal skin with a furious look. The Goddess mounts a donkey and has a deadly iron hook in one hand with a sword in another. She has a kapaal in the third hand with a abhayamudra or varmudra in the fourth. The Goddess blesses her devotees by protecting them, removing all fears. It is believed that Parvati removed her fair skin to kill the demons Sumbh and Nisumbh, hence the color of the day is white. Mahagauri symbolizes intelligence and peace. This manifestation of the Goddess is described as complexion fair as milk, with extremely beautiful calm and peaceful face wearing rudraksha as jewelry and dressed in white. The Goddess blesses her devotees by taking all their troubles and provides them peace. The color associated to this day is Pink which depicts optimism. On the last day of the festival also known as Navami, people pray to Siddhidatri. Sitting on a lotus, she is believed to possess and bestows all seven types of Siddhis (supernatural powers). The Goddess Siddhidaatri mounts on a tiger and posseses all the weapons like Dhanush, arrow, gada, kamamdalu, sword and is also depicted holding a rosary and lotus flower. The Goddess blesses her devotees using these Siddhis and gives them Moksha or liberation from suffering. The nine manifestations of Maa Durga that are held in mind and heart during Navratri, are believed to lift the divine spirit within us, in order to help us overcome obstacles and remove any unnecessary qualities that lie within us. This lifts the veil ignorance or maya which leads to a new-found inner freedom and greater sense of purity. We here at Anahata will be joining in on the celebrations by encouraging our residents / guests to hold the messages of each of the goddesses in mind and heart throughout the ten days. We hope that the social media campaign we’re running during the celebration will help to encourage these qualities to arise within you. It might also inspire you to boost your personal sadhana practice in order to cultivate inner transformation to positively influence your levels of awareness in all aspects of life.